School is one of the biggest aspects of my life, so I wanted my blog to reflect that. Currently, my most difficult class by far is AP World History. It's the first AP class I've ever taken, so it's been a bit of a transition from anything else I've done before. There is a lot of information and work in this class, so taking notes is very crucial for me to do well. Social studies classes in general require a lot of memorization and just flat out knowing the material. 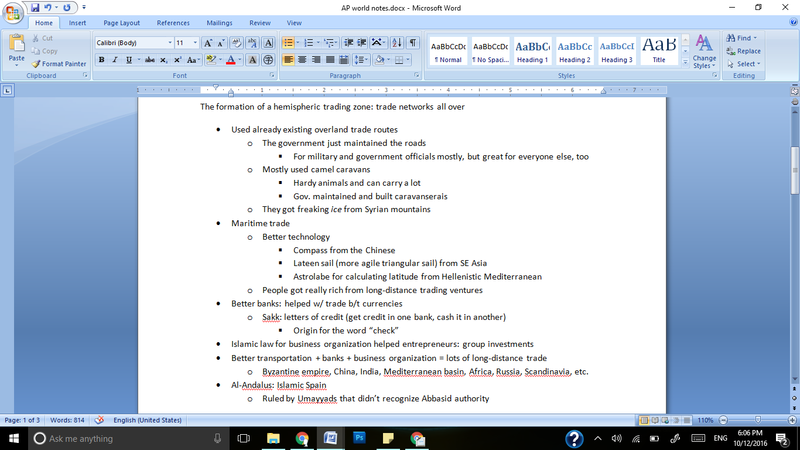 I've already taken a lot of notes so far in AP World, so I've gotten my note-taking system down pat. It may seem like quite a bit of work for some people, but the effort has paid off; I've gotten A's on everything in the class so far. 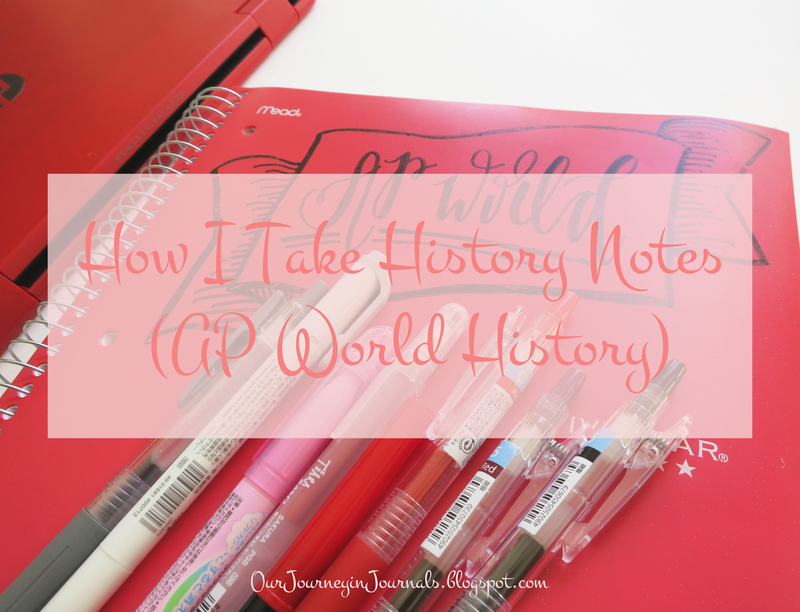 In this post, I'll be elaborating on how I take notes for a history class in a way that doesn't require too much thinking (specifically WHAP, obviously), but I've rambled on enough, so let's get to it! 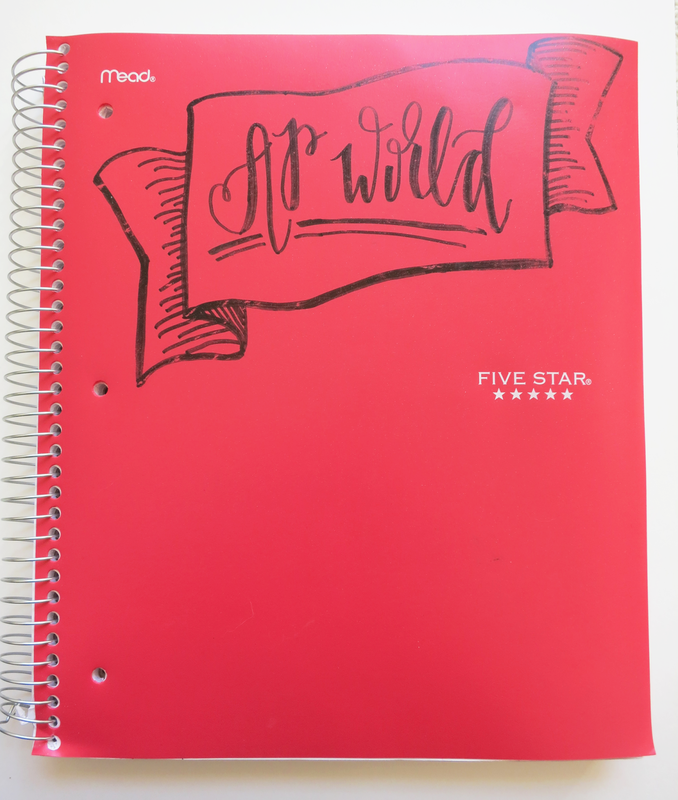 I was warned by friends who took AP World last year that we would be taking a lot of notes in the class, so I got a three-subject notebook (though I may need to get another one for second semester since I've already filled up almost half of the notebook, and it's only been one quarter). It's just a normal Five Star notebook from Meijers, my local grocery store/supermarket. The paper isn't amazing, but it's good enough for just school notes. My main tool for writing is a black 0.5 mm gel pen. 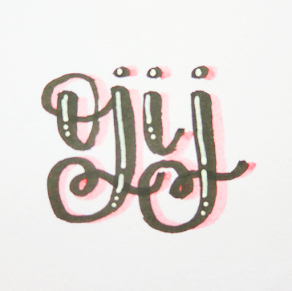 I quite like the Muji Retractable Gel Pen, but my favorite is the Pilot Juice. I also use colored gel pens that go with my color-coding system - mostly various 0.5 Pilot Juices, but I'm also using a 0.7 gray Zebra Push Clip. And finally, I use a Crayola Super Tip marker, a Sakura Gelly Roll Stardust, and various highlighters (a Zebra Mildliner and a Pilot FriXion). 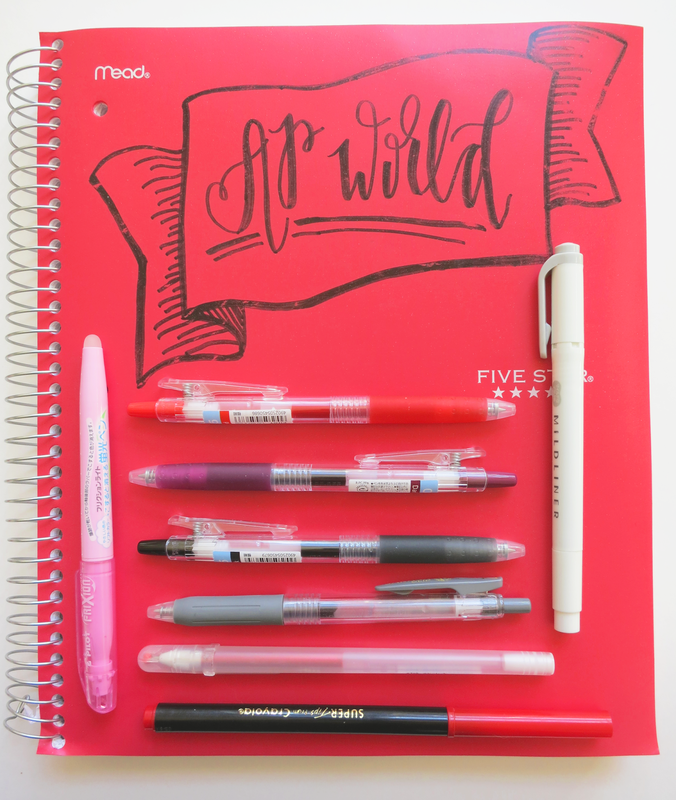 I'll be explaining the use of each of these different writing utensils later in this post. Some random other things include a giant thing of correction tape from China, my laptop (an HP Pavilion 13 x360 laptop with Windows 10), and the history textbook that my school uses (Traditions & Encounters: a Global Perspective on the Past). When making a note-taking system for any class that you're taking, always make sure to adapt to your textbook and to how your teacher structures the class. In my class, my teacher assigns textbook reading pretty much every night as homework and then lectures about that topic the next school day. This is how it almost always works in this particular class, so my system revolves around this pattern. First, I read the textbook section the night that it's due. This ensures that I already have a good basis of understanding for the next day's lecture topic. 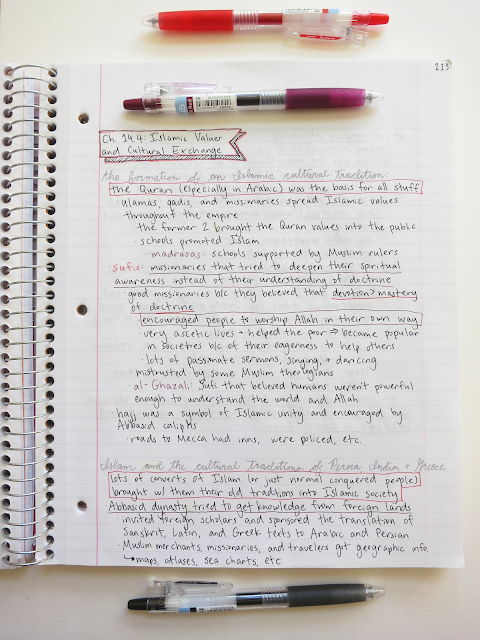 I take notes over the reading on my laptop using a typical outlining technique based on the mini subsections that each section of the textbook has. Our textbook is divided into units, then chapters, then sections (which each have their own topic), then subsections, then sub-subsections. 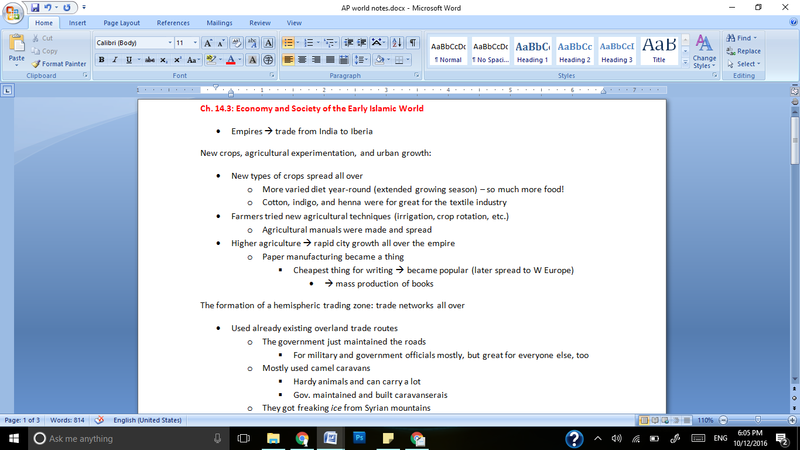 When I first do notes on my computer, I put them all in my "AP world notes" Word document. I type out and bold the title of the section (e.g. "Ch 14.3: Economy and Society of the Early Islamic World") and do my notes under there using a hierarchy of bullet points. In other words, the bigger, more general points are further to the left, and any details about the information is underneath it as a bullet point to the right. Here is a better explanation. I also use the title of each subsection in the textbook as the title of each subsection in my notes. I try to paraphrase each paragraph of reading into one or two bullet pointed phrases, though I still find it a little hard to condense information. However, I do need to mention that actually doing the reading is very important in history classes (especially AP World); often what separates the people that do well in the class from the people that don't do well is whether or not they actually read the textbook. Next, I take notes over the lecture. Like I said earlier, the lecture topic is the same thing as what the textbook reading from the previous night was about. I pay attention to what my teacher says, and then I add his points into my notes wherever appropriate. This is the main reason why I first type out my notes; it makes it a lot easier to edit everything and create a master set of combined notes - or a final draft of both my textbook and lecture notes, if you will. I start out each chapter with a brush calligraphy header (using a Crayola marker - you don't need to be fancy) that says the chapter number and title. I begin each section with a banner that says the section number and its corresponding title. I then start copying my notes onto paper. When I do this, I start to implement my color-coding system. Subsection titles: usually in gray cursive to make them stand out a little more - e.g. "new crops, agricultural experimentation, and urban growth"
However, my color-coding doesn't necessarily have hard and fast rules. The importance of something (for example whether I use red or dark red) is often relative to the rest of the information in that section or on that page. I sometimes combine different things (like maybe something will be in red and boxed with dark red) to make it even more important. This makes it easier for me to take notes quickly but still be able to scan through my notes and find the important things. I also use some abbreviations and symbols. This saves some time and effort, especially when we're in a chapter where one word is talked about over and over again but has a really long name. 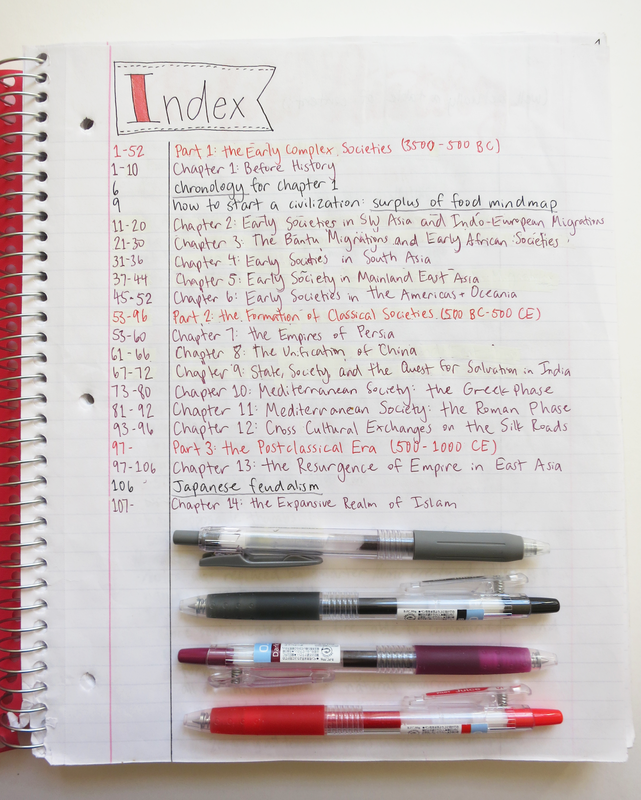 As you can probably tell, a big portion of figuring out your note-taking system for different classes is adapting it to how your class and your textbook is structured. The way I take notes is different depending on the subject, and the way I'll take notes for next year's history class will probably be different, too. Anyway, just make sure that whatever you do, it's working for you and helping you do well in that class. 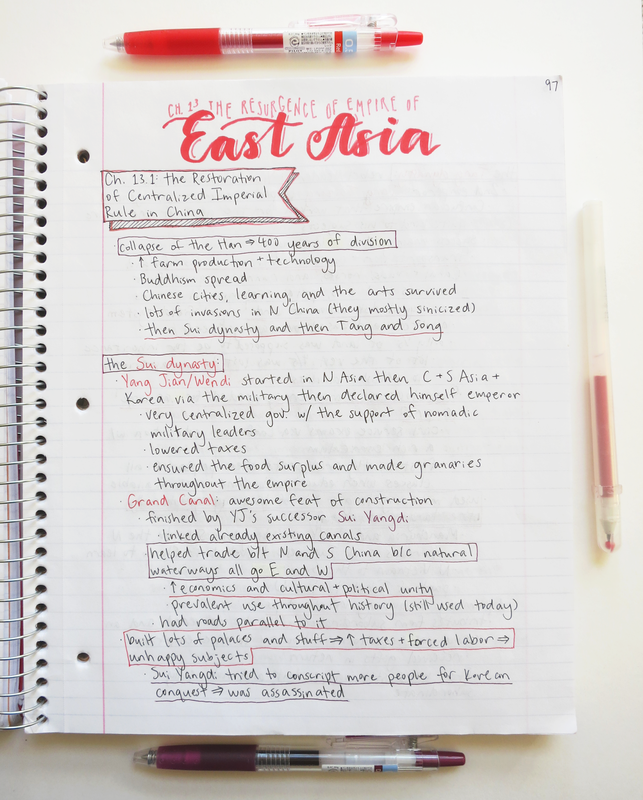 How do you take notes for history class?